It's Pure and Creamy and Perfectly Refreshing - Just The Way Milk Should Be. But When You Choose Organic, You're Choosing Something More. 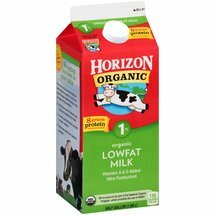 It's The Wholesome Nutrition of Milk Made Without The Use of Added Growth Hormones, Antibiotics Or Dangerous Pesticides. So Drink Up - It's Good For You, Good For The Earth and It Tastes Great!,Vitamins A & D Added; Ultra-Pasteurized.,Usda Organic; Kosher Dairy; Grade A.